PartyCartoons.com is a caricature artists and entertainment company. We are also fully Licensed and insured! WE DO EVENTS 7 DAYS PER WWEEK - Monday thru Sunday! Day or Night. Q: Are you planning a party or a special event or maybe a Private or Corporate Event? or New York State NY?, then you came to the right place! The is the perfect entertainment for your next event or party! Private Parties - Sweet 16's - School Events - and many more. 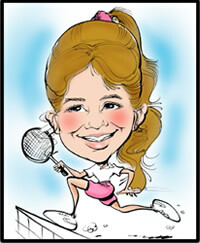 Caricatures are also a great event or party favor! Need more than one caricature artist? Not a problem! We have more caricature artists available. NOTE: Why take a chance with an "out of state" entertainment agency, that use artists that are not licensed and insured, when you can work with us. Doing business with a local entertainment company will give you piece of mind and you will get excellent service. You will always know where to find us and we will always be here for you! If you need a drawing, cartoon, or illustration for your next print or web business project, our professional illustrators are here to serve you. Give us a call!